So your family members (or out-of-town friends, or in-laws, take your pick!) are in town for the holidays, presents have been opened, feasts eaten, and now you need to entertain them. Naturally, you bring them to the Museum, knowing that you’ll be able to impress them with the architecture, a work of art in and of itself. But you want to impress them in the galleries, too; you want to show them something so incredible that it’ll even stun the know-it-all of the group. Look no further than Claude Mellan’s Sudarium, currently on view in the Museum’s exhibition, Framing a Decade: Acquisitions of Prints and Drawings, 2001–2011. Skim through this blog post, impress your family with a mini-tour, and prepare to watch jaws drop. Guaranteed! At first glance, this print seems to be just another image of a sudarium (that’s Latin for “sweat cloth”)–also known as Veronica’s veil. The story goes that Saint Veronica met Christ on one of his journeys, kindly wiped his brow with her veil, and, miraculously, his face was imprinted on the cloth. Artists throughout the ages have been drawn to this subject: since the image appeared miraculously, as if by God’s hand, to create an image of the sudarium was a bit like comparing your artistic ability to that of the Big Man himself. A little blasphemous? Perhaps. But it sure could do wonders for your artistic reputation. Claude Mellan’s interpretation of the veil is indeed almost a miracle in and of itself. 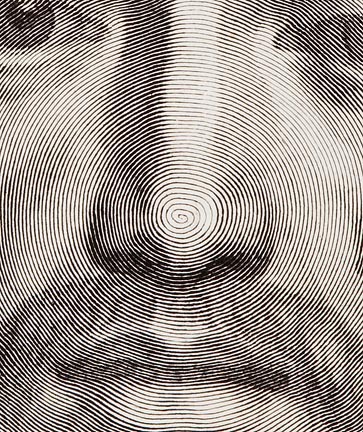 Ask your family and friends to take a close look at the tip of his nose, pointing out that it begins in a spiral, almost like the whorl of a fingerprint. Now have them follow the line, and watch their eyes widen. 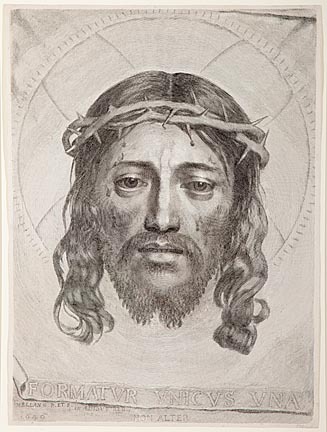 That’s right–Mellan created this print out of one single line, varying the pressure to create shadows and depth within Christ’s face. They’ll think that’s pretty great. But wait until you tell them how it was made–not a pen or brush and ink drawing, where it could conceivably be pretty easy to change your pressure to vary the lines. Nope, this is a print–more specifically, an engraving. Mellan got a big sheet of metal and incised it with a sharp tool called a burin. I’m not sure if you’ve ever incised metal, you’ll say to your family, but it’s not exactly easy to do–kind of like drawing with a sharp pair of scissors on a car door. After he incised the lines, Mellan brushed ink onto the metal plate, flipped it over onto a piece of paper, and ran it through a heavy printing press–which means, of course, that the image was reversed. So in addition to drawing the whole thing with one line, he even incised the Latin inscription at the bottom backwards. If that’s not enough, you can share a behind-the-scenes tidbit straight from the curator’s mouth. Mary Chapin, the Museum’s Associate Curator for Prints & Drawings, who put the Framing A Decade exhibition together, told me that this print was printed posthumously. It’s not always good to have a print that wasn’t printed by the artist himself–but in this case, she said, the print was so popular and the quality of this particular one so great, that the Museum felt just fine about acquiring it. They even did some scientific research on the paper, finding it was printed only about 70 years after Mellan’s death–not too bad at all. Got any more tips for showing off the Museum to visitors of our fair city? (If they’re good, maybe we’ll even add them to another edition of our special “Impress the Out-of-Towners” tour pamphlet!) Let us know in the comments below! This entry was posted in Art, Exhibitions and tagged 17th Century Art, Claude Mellan, engraving, European art, Exhibitions, Framing a Decade, From the Collection, prints. Bookmark the permalink. I wonder if the museum could give me an idea of the number of prints that were originally produced of Mellan’s ‘The Sudorium’. I happen to have a copy in my private collectiion. Hello Martin, thank you for your comment! I passed your question onto Mary Weaver Chapin, the Museum’s Curator of Prints and Drawings. Here is her response: “That is a great question, and I regret we don’t have a good answer. There are no records about the number of impressions made of Mellan’s Sudarium. It was only very recently that artists began to number and limit their impressions. In fact, Mellan’s plates were in circulation for centuries after his death, and there are some impressions that were pulled in the nineteenth century. The copperplate is now in the collection of the Bibliothèque royale in Brussels.” We hope that helps you! When I read that I was like WOAH, I live in Brussels, I’m going there tomorrow now to go see it! Thanks I had no idea, I was looking forward to going to Amsterdam and see one of the prints there, but the plate is so much more interesting! Thanks! Michell, how exciting! The plate might be in storage, but we all hope you get to see it. Be sure to come back here and tell us what you thought! I went there today but they’re moving the entire department so they didn’t let me see it, nor did they seem interested in taking an appointment to take it out. I have to wait until “January, or Feburary or March” – in their words, until the collection is moved into the main building or something. I was pretty disappointed, but I’ll just wait and try again next month, or the month after, or the month after, haha. In one of my classes we’ve been discussing walter benjamin, and his whole idea about the “aura” surrounding original work, as the prints are all reproductions that’s one thing, but I am curious to see if being in the same space as the copper plate has any such aura to it. I think this work is extraordinary, the technical work seems beyond applied skill, so I feel like there’s something more to this piece… I have a suspicion that this is an iconic piece of religious art, the processes in which the artist/monks would undertake before approaching the creation of a work is fascinating, days of fasting and cleansing and meditation… like I said, I think this piece is above and beyond, I’m really excited to see it in person, I just have to be patient! Anyway, I’ll let you know my comments when I do get access to it! Awesome, Michell! Our curator and I hope you get to see the plate in the coming months (we are both very jealous!). I love the Benjamin idea, and look forward to hearing how it applies when you see the plate. Good luck!